There’s a Robo-Pong robot for every ping pong player’s pocketbook–from our 540 &1040 models—to our top-of-the line 2040 (that captures& recycles your ping balls). You can upgrade from one model to another at any point. 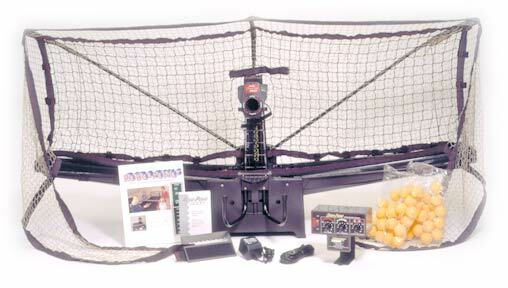 Robo-Pong robots are the best selling, most affordable robots in the world. There’s a robot for every pocketbook, and you can upgrade from one to another at any point. Outstanding track record and reputation since 1988 for product performance and service. Newgy’s robots are renowned for being very user-friendly. You'll have everything you need to begin playing within a few minutes of opening the box. Set at your own speed, spins, oscillation (movement of ball direction back and forth across the table)–and even retrieve & recycle balls. Newgy robots are fully adjustable to match anyone's playing level from novice to the professional. Selection of spin type, oscillation range*, and trajectory angle is straightforward and easy to understand. 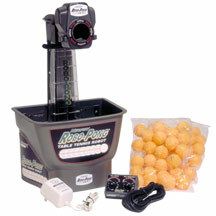 Remote controls provide convenient regulation of power, ball speed, ball frequency, and oscillator speed*. 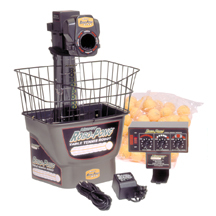 Our top-of-the line 2040 model recycles balls so that you can play as long as you want without retrieving any balls. And Newgy robots are made of quality parts to ensure reliability and durability for many years of hard use. *Oscillation (that is, being able to move the ball by varying degrees from side-to-side) is available only on models 1040 and 2040. Model 540 does not have oscillation controls. For complete documentation of robot procedures, adjustments, diagrams, warranty information, and parts list, please download the Newgy Table Tennis Robot Owner's Manual (1.4 Mb). and see our Robo-Pong Features Comparison Chart.